Kindle users get it FREE from 12/10 to 12/14, then afterwards just 99 cents! In the dawn of the Fifth Age, ancient wisdom needs a modern girl. Meet Crystal Blue. Child of the Stars. Born to Illuminate Humanity. What if you suddenly learned from a green-eyed stranger that you're an Avatar, someone gifted with the ability to walk between worlds? And what if you learned that you were the only person on earth capable of re-wiring humanity by traveling the world over in one year's time, unveiling and sharing the secrets of the ancients'? What's worse? What if you had no choice? If you do not accept your mission—the mission you were born to fulfill—a large portion of Mankind may cease to exist! Well, this is Crystal Blue's problem…she doesn't want the job. But, because the green-eyed man—the man she's never met but has dreamt of her whole life—has just saved her from bleeding to death in a 7-11 where she's left after a botched kidnapping, Crystal feels a certain obligation to at least listen to him. His name is Dr. David Lange, a physics professor now decoding the ancient manuscript which tells him of Crystal's mission. Only days before, Crystal found the large red, leather-bound book with the gold snakes on its cover in the basement of a bookstore. The discovery should have been a clue that her life was about to change since the book did try taking a bite out of her, then transports her to a place where a mysterious energy painfully activates the eleventh layer of her DNA, and she meets a blue-scaled dragon that sounds like her Irish grandmother, awakening to discover streaks of blue threaded through her long, dark dreadlocks…but it didn't. Not until she's attacked by an over-sized serpent in David's home while playing the piano and left with a strange tattoo around her neck does Crystal finally accept that she isn't your ordinary teenager and maybe she is a bit…special. Yet again, this is a problem: she doesn't want to be special or go anywhere. After being fairly miserable for most of her eighteen years, she's finally found a bit of happiness. She's just moved in with her estranged, older sister, Claire, and landed her dream job at The Blue Crystal Bookstore in Minneapolis, owned by the elderly Cosmo Attis; her newest friend. But most importantly, she just wants to be with Adam, the handsome, mysterious young man who notices her special blue aura when he first sees her. 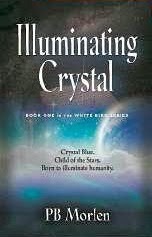 Unfortunately, the manuscript warns David of ill-fated consequences if Crystal and Adam come together. Crystal must leave and she must leave those she loves behind. Fortunately for Crystal, she won't have to travel the world alone. David, the book's chosen scribe, will join her along with The Guardians, a select group of soldiers and a huge dog named Wyndon. They will offer their protection when trouble draws near. And trouble, in the form of the serpent, an angry energy guarding the ancient secrets, will follow Crystal, trying to stop her from illuminating humanity. Crystals hold the highest vibration in the mineral kingdom. The blue crystal, a powerful and rare specimen discovered in remote areas of the world—which only a half dozen cases of discovery have been reported—holds the highest. Three of these specimens' whereabouts are known: NASA keeps one, the Vatican another and one particularly large specimen sits in a remote museum; the rest are as yet unaccounted for. There is another one, however, that will never be found. Scientists speculate that the inner core of the earth is a primarily solid sphere—they are wrong. A giant blue crystal, smaller than the moon but more beautiful than the sun, makes up earth's inner core: The spirits of the ancients dwells there and they wait for the blue serpent, the one who has the power to release them. The sky was full of stars. Their bright light illuminated the path that the beautiful woman walked on. The colorful light emanating from her was even brighter than the stars as she glided effortlessly through the mist, and her soft-white gossamer gown billowed around her slender, regal form. A large blue serpent with iridescent scales wove its way alongside her, every so often disappearing into the mist. Over her head flew a great white bird, its wings stirred the air softly and gently brushed her face in its passing. She looked up and smiled fondly. And then, with a mighty downward thrust of its great wings, the white bird soared high up into the night sky and disappeared. Six women and one man waited for the woman to arrive to complete their gathering. He stood with the sisters in a circle and watched the seventh sister, Akasha, appear out of the milky white mist; he thought she was the brightest and the loveliest of them all. Even though he'd known her for many, many years, the sight of her still took his breath away. She was an angel of the highest order. Her smile lit up her lovely face as she greeted them one by one. She took her place at his side—he sat first and the sisters followed. They all shared their thoughts. Speaking was not necessary for them. He heard her lovely voice in his head. "Adamas," Akasha's eyes sparkled and her lips lifted in a smile, "my sisters and I have decided that it is I who will be leaving." Adamas hung his head; he did not want the sisters to witness his grief. He knew her departure was imminent, necessary and expected. "The call has gone out," she cast her eyes upon all of her sisters, "and we have answered." "Must you really go?" He wished it was not her that would leave, but another sister. "It was my name that was called," she said softly. "Do not forget that my name was also called," Adamas said. She smiled and nodded her head. "We knew this time would come." "But I did not know it would be you." He hung his head once more. He no longer wished to look upon her face. "You will forget your name upon your arrival, and you will not remember who you are. The energies are heavier than they once were – the veil is heavy and thick. Your light will diminish." "Yes," she smiled, "I know. It seems like only yesterday that I visited the blue planet. They called for us then, we answered the call, and then we returned home. This time it will be different. This time I travel alone and I may not return." He knew this—they all did—it was expected of one of the sisters, and it would be her. "The ancients will soon be leaving the blue planet and the care of earth will now be up to the humans," Akasha said. "I do not travel to teach or to lead. This time I travel to witness something never seen in the history of the humans and to help anchor in the new energy they will most certainly need. The humans have passed the test and they are ready." She looked at each of her sisters. Their beautiful colors streamed off them, casting rainbows in the air. She looked at her beloved Adamas, the one her heart loved the most. "You cannot help me, Adamas," her voice was but a whisper. She knew what he was thinking. "I do what I please," he responded. Her twinkly laugh rang through the still air and the stars danced. "You may not find me, I am quite cunning. Besides, you will only be a distraction." She walked towards him and took both his hands. He gripped her hands tightly. "I will do what I must – I will not distract you," he said. "I made a promise long ago and now it is time to make good on that promise. And, Adamas, I am of the sky and you are of the sun." Her blue eyes sparkled. "Together our energies will be too great for the planet to bear." "I will give up my greatness. It is what I wish." The sister, Alectra, interrupted their silent conversation. "You cannot govern what Adamas does, Akasha. He was a priest of Telos, do not forget that. The blue planet will remember him – he may return at any time. It is because of you that he has stayed with us so long." He looked at her and nodded his head. It was time he returned. Besides, he had his own promise to keep. Alectra said, "Akasha must travel alone, Adamas." "That is why I must go." He set his chin stubbornly. "I will protect her." "No!" Akasha's blue eyes flashed. "I do not need your protection. I am one of the seven sisters," her gaze softened, "I only need his love," she whispered, smiling softly at the man whom she adored and had loved since the beginning of time. "Know this," said Athena. "There is a time for the reacquainting of love. Now is not that time. Now is the time for Akasha to visit the blue planet. She will forget who she is and will have to remember her greatness – just like the others – that is why she has been called. It is a time of great awakening for the humans. They will need her light." The sister Anastasia stood and smoothed the folds of her long, green dress. "The energies of the blue planet are very strong, Adamas. Akasha's spirit is not of the earth, and neither is yours. But your spirit is tied to many lifetimes on earth; Akasha's spirit was only on earth for a short time. If you go, you must not let your emotions misguide her. If you do, she may turn away from her purpose. You must not let that happen." Aurora joined in. "Find those that you love the most and keep them close, Akasha—the serpents will find you and so will he. The ancients must leave so they may set their energy in one of the new earths. They cannot give you the aid that they once did. Look to the heavens, Akasha, for it will be there you may seek counsel." The wind picked up and the colors emanating from the seven sisters began swirling together. The man watched his beloved Akasha close her eyes and raise her arms high over her head. Her bright light leapt out of the array of colors and soared upward and in a blink she followed and then she was gone. "Remember," Astra said to the man who looked to the sky, "our sister is strong, but her love for you is stronger. Do not interfere with her task as you fulfill your own journey's agenda. Remember what Akasha said, you are of the sun, she is of the sky. If your energies become reconnected, it could prove to be dangerous to those who live upon the blue planet." He thrust his chin. "I said I would give up my greatness so that I could be close to her. I will do what I must." The sisters nodded their heads; they knew what he spoke of. "Once you have made your choice you cannot change it, Adamas," Alcoyne said. "Are you sure this is what you want?" "You will have less than half your strength," Aurora said gently. "You will not be allowed to gain it back until your mission is done. And she may be gone by then." "If I can be near her, then I choose this. I have made up my mind." Once again the sisters nodded their heads. And slowly out of the white mist the blue serpent slithered slowly forward. Adamas smiled at his friend whom he knew would follow. After all, it was time for her to travel to the blue planet as well. "We will be watching you, Adamas," Alectra said. "We will be watching you both." He watched as all the sisters exploded into six colorful beams of light and danced into the night sky. And then, for the first time in hundreds of years, the man sought out the energies of earth. He immediately felt the tug of her seductive energies; he remembered the feeling quite well. He knew the life he must live; he had an agreement to keep. Out of love for his Akasha, he prepared to give his power to the sun and return to Tara, the beautiful blue planet. The man looked down and saw the large blue serpent winding its way between his feet. He smiled and nodded his head at the beautiful reptile whose multitude of blue-hued scales shimmered magnificently. Then he watched the serpent disappear into the mist; he knew he would see her again. With arms upraised and eyes to the sky he called out the name of his ancestors. To them he gave his greatness – he knew that he, like her, would have to forget who he was so that he could experience the remembering. After all, it is what humans have to do in order to evolve. And then he felt himself begin to tear apart, and in one last fiery display, he threw the sun's power out of his hands and gave himself up to the energies of Gaia. In a shower of sparks the man transformed into two beams of blue light and disappeared into the night sky. This is the one we have been waiting for.